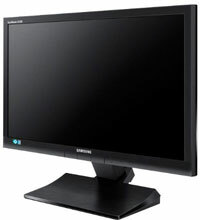 The Samsung SyncMaster S22A200B has been discontinued. No direct replacement is available. Samsung"s lightweight LED Business Monitor SyncMaster S22A200B provides another energy saving option through its low consumption levels. This reduction in energy helps both financial and environmental aspects of the business, and is an important part of any work operation. The LED Business Monitor SyncMaster S22A200B is also remarkably lightweight and reduces the hassles associated with transporting monitors, and is just one more way that Samsung is helping enhance the working environment.